Standing on the corner of St Michael’s Road and Bramble Road, opposite St Michael’s church, is an imposing Victorian house called Woodlands. Locals, unsurprisingly, used to know it as the “big house”. It was built between 1886 and 1890 by James Mitchell, a successful Limehouse draper. Today it is surrounded by trees so that its architectural details are hidden from the passing eye. Woodlands Corner 1970s. The imposing roofline of Woodlands can be seen through the hedge above the car. 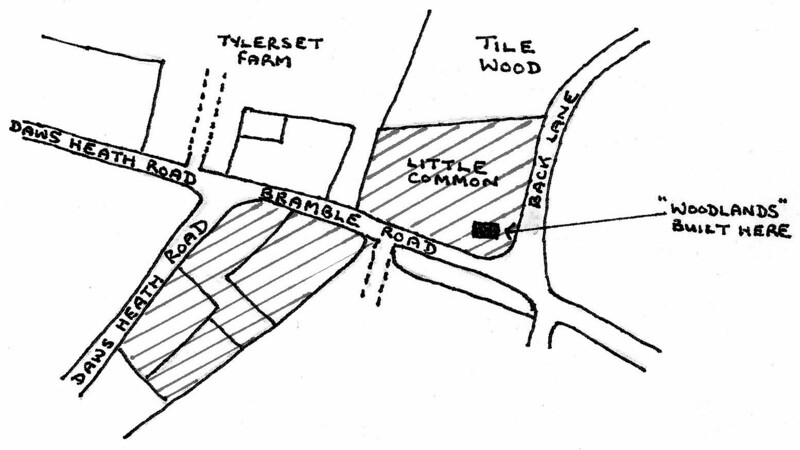 The land that Woodlands originally stood upon was once more extensive and had been known as Little Common. 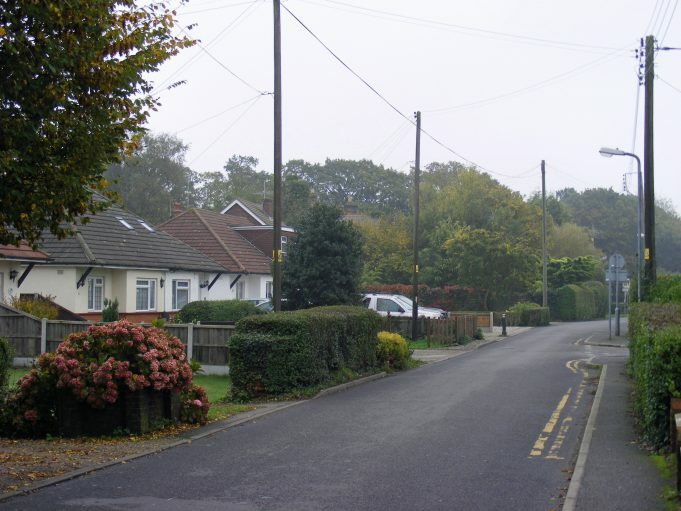 It consisted of two acres of waste land of the Manor of South Benfleet and Jarvis Hall until 1804 when it was granted to John Wink, a Rayleigh schoolteacher. He was already in possession of another large plot of Daws Heath land where he had built a cottage, on the eastern side of the sharp bend in Daws Heath Road, known as Rivers Corner. Together these pieces of land changed hands several times before they were bought by James Mitchell in 1885. Mitchell had begun negotiations for the land well before September 1884. At that point the land still came under the manor court. It was therefore necessary for the Lord of the Manor to grant the land even though a sum had been agreed between Mitchell and the previous owner. Unfortunately, the Lord of the Manor having fairly recently died it was up to his wife, Mrs Perry Watlington, to sign the necessary court papers. She was extremely ill and was unable to sign her name. It was not until November 1885 that she, still unable to write, was persuaded to make her mark. 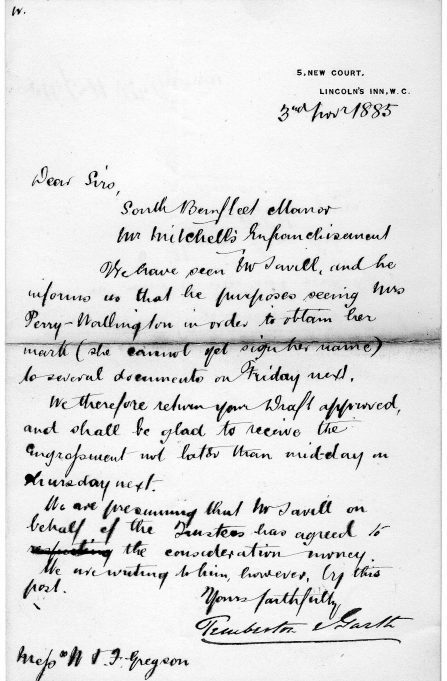 A month later a deed of enfranchisement was signed so that Mitchell became the sole owner. Woodlands and the rest of his land at Daws Heath were no longer part of the Manor. The belated final stages of the purchase in sight ! Why did a draper from London’s east end desire a property in remote Daws Heath? We can only surmise the reasons from a study of his life and family. He was the son of a Leicester draper and laceman who had moved and settled his family initially in Bethnal Green. By 1848 the father, also James Mitchell, had a shop in Northumberland Place, Commercial Road, and his son learnt the business working beside his father. The younger James had his own shop by 1859 at 63 Three Colt Street in Limehouse and he seems to have been very successful because by 1881 his business premises had moved to the East India Dock Road, the main thoroughfare to and from the docks. The family business continued at 11 East India Dock Road for at least 45 years. The road outside the shop would have been incredibly busy with great lumbering cartloads of goods and the horsedrawn vehicles of business men. Plenty of local pedestrians from the dockland families who lived in the surrounding teeming tenements would have walked past the shop. With the coming of motorised cars, lorries and buses it probably became noisier still. Perhaps James became desirous of more peace and quiet and a healthier place for his wife and six daughters. 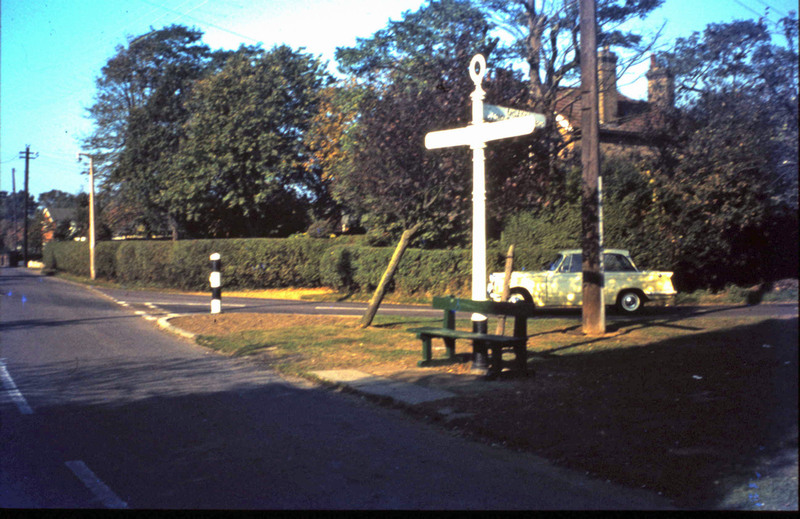 Woodlands Corner [date unknown]. 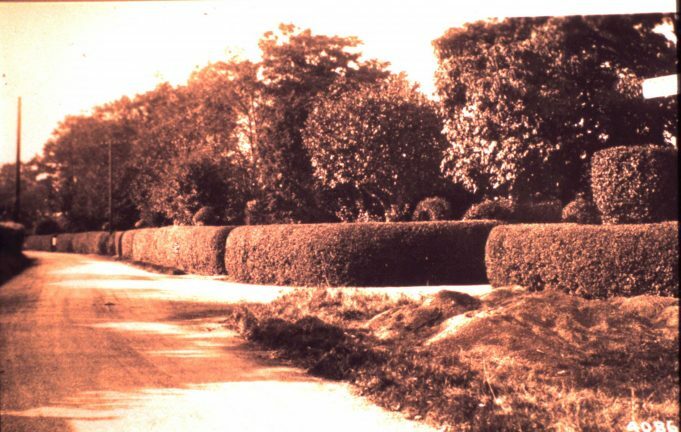 Note the immaculate hedges stretching down Bramble Road. The six daughters of James and Elizabeth Mitchell were, in descending order of age, Edith, Jessie, Clara, Helen, Miriam and Emma. They all came to work in the shop and all were long lived and remained unmarried. When James bought the Daws Heath land and began to build Woodlands, he was 53 and his eldest daughter, Edith, was 27. It appears that James himself commuted from the shop to Woodlands, probably at weekends, whilst Elizabeth and two of the girls kept house at Daws Heath and the other four daughters worked and lived at the drapers perhaps commuting regularly or occasionally at weekends. Quite why all six daughters remained spinsters is puzzling although strong rumour had it that James did not want them to marry. If they were to marry it was said they would be cut out of his will. Perhaps he did not wish to pay for the weddings or he did not wish to lose any of his labour force. However, we should remember that these were only rumours. Eventually, James retired from business. The 1911 census shows Edith as the draper assisted as ever by her sisters. The last appearance of the Mitchells in the London Directory was 1926 where it was recorded that 11 East India Dock Road was the province of Edith and Jessie Mitchell, linen drapers. Edith and Jessie were 68 and 67 respectively in 1926 and the family was very well off. It seems likely that the business and its property were sold at this point. In the previous edition of the paper, an announcement of James’s death included the following, “Deceased had led a retired life and had not been associated with any local institutions or public life.” Further proof perhaps that he wanted to get away from commercial life and the hustle and bustle of the East End dockland area. Rural Daws Heath in those days must have been as far from that hectic life as it was possible to get. 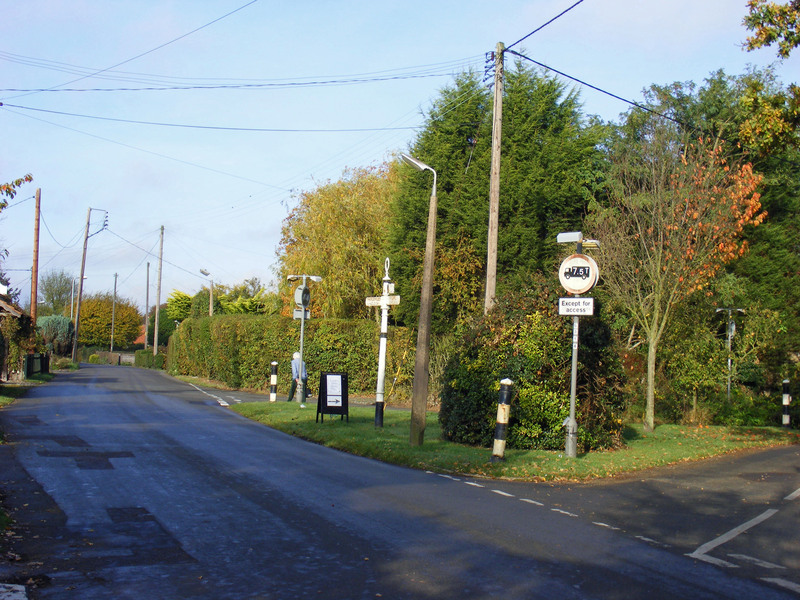 There is a rumour that still persists that James Mitchell “pinched” some of his land at Daws Heath but I have found nothing to substantiate this. On the contrary, there is documentary evidence that he came by the land honestly. I have in my possession a number of letters exchanged between the solicitors for the Manor of Jarvis Hall and those acting for Mr Mitchell. The final transactions are recorded in the Manor Book. The late Doris Staines, who lived most of her life in Thundersley, told me an entertaining story of children’s mischief around 1920 which affected the Mitchell sisters. It was customary for a bonfire to be lit for Guy Fawkes Night on the triangle at the road junction beside the Mitchells` house. On the morning of the 5th November, Doris, her brothers and other children were sent out to gather more wood for the fire. One boy suggested that as there was a great pile of faggots at the rear of Woodlands and the occupants were out they should take some and dump them on to the fire heap. This they did to the tune of 100 faggots. Later, when the fire was lit, they were very amused to see two of the Mitchell sisters, innocent of their depleted wood store, thoroughly enjoying the bonfire from the safe distance of an upstairs window. Next day came retribution when Mr Rolph, the Mitchells’ groom, discovered the crime. A policeman called at various houses resulting in ears being clipped, recompense paid and bottoms walloped with carpet beaters! The six daughters of James Mitchell lived comfortably at Woodlands for the rest of their lives. Their wills confirm that the family business had been very successful. Each of the sisters left substantial sums of money. Their father had left his personal and real estate to be divided between the six women. The relationships between the daughters must have remained reasonably harmonious because each sister in turn left the bulk of their personal estates to be equally shared between the remaining siblings. What the ladies did during their retirement in Daws Heath we have little knowledge. The Mitchells are a distant memory for even long term Daws Heath residents. They lived in the big house, were genteel and kind but, apparently, were not out-going by nature. Derek Owen of Daws Heath told me that in about 1910 his mother, then a young girl, was regularly employed to clean and polish the Mitchell’s horse tack. When the new church of St Michael’s was built in 1921 just across the road from Woodlands the Mitchell sisters were early members of its congregation. In the 1930s on the field beside and around their house they kept goats for a while. In 1913 the gross value of James’ estate had been £9,752. When Miriam, the last surviving sister, died in 1960 the estate was worth £42,603 net. She left to 13 legatees including relatives and friends various sums of money, ranging from £200 to £1000. Additionally, her gardener, William Andrews, received £50 and her other employee, Emily Butcher, £100. Emily, who was presumably a housekeeper, had figured in Edith’s will of 1943 when she had received £10 so it would appear that Emily Butcher had been the ladies’ faithful retainer for many years. The only other servant to receive a recorded legacy from the family was James Rolph, the groom, whom James refers to in his will as “my man”. There was stabling to the rear of the house and James used to drive his employer and the ladies to the station and other destinations in a horse and trap. James with his family lived in a house at Rivers Corner that belonged to his employer. He is still remembered by some of his descendants today. In his later years he often sat in his favourite place on the north side of the cottage against the chimney. The Mitchells were undoubtedly some of Daws Heath’s earliest London commuters. I am sure they would be surprised to learn just how many local residents now commute to London on a daily basis. 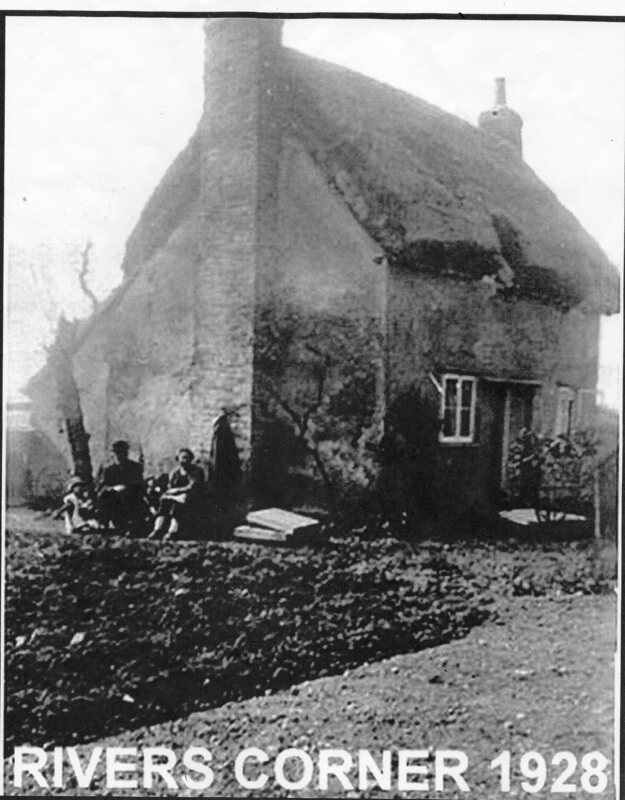 Great to see what appears to be a picture of my great grandfather JAMES Rolph outside his cottage at Rivers Corner. ‘Woodlands’ being built on ‘Little Common’, however legally technically, might well be seen as a dodgy arrangement by people who had the use of it as a/their ‘common’ land? There is a story of a neighbour keeping his faggots stacked there, as would be possible on a common. Excellent research, particularly as a different (questionable?) version had been recorded previously. Who is the Lord or the Manor?